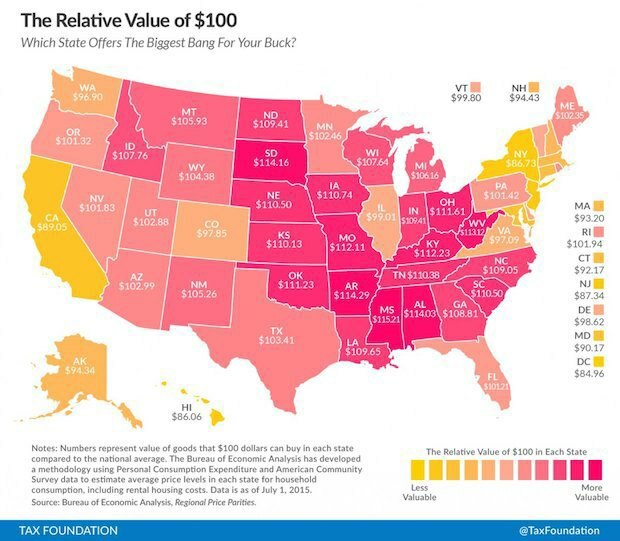 The Tax Foundation has released a map which reveals how far $100 will get you in each US State. This was compiled using data from the Bureau of Economic Analysis, compared with the national average. Not surprisingly, California and New York didn't fare too well, at $89.05 and $86.73 out of $100 in value. In Washington, D.C., $100 is worth $84.96. You can get the best bang for your buck in Mississippi and Arkansas.